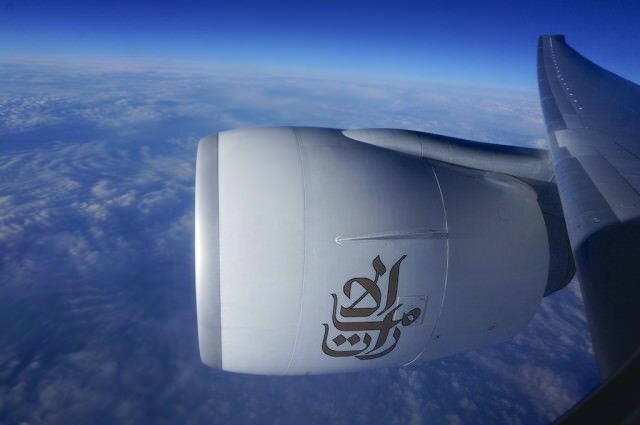 Lyon, France — After 18 hours of sitting on two Emirates 777s from Singapore to Dubai to Lyon, I arrived in this sprawling city situated in France’s Rhône-Alpes, cleared immigration and customs and proceeded into the Arrivals Hall. 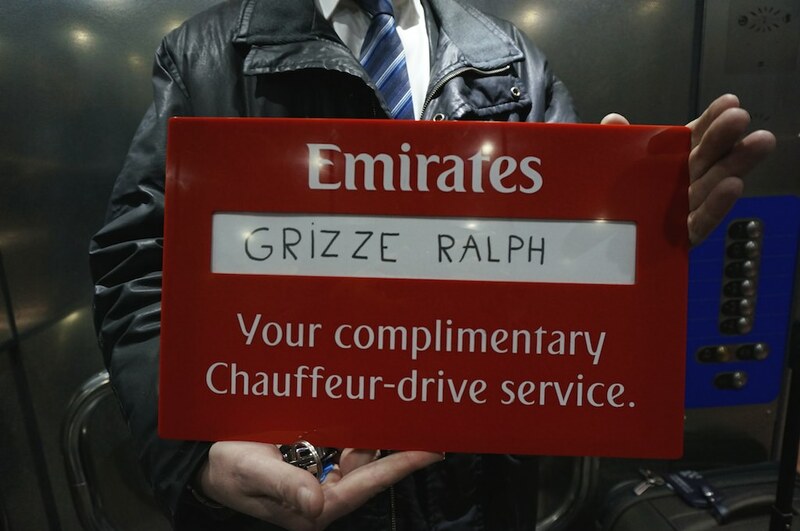 My new favorite airline, Emirates, included complimentary chauffeur-drive service for Business Class passengers, and my driver was waiting for me with a red placard carrying my name. 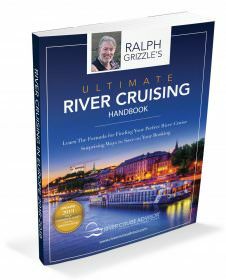 Moments later, he put me into the back seat of a brand-new Mercedes C250 to deliver me to Quai Claude Bernard (the drive took about an hour with traffic) along the banks of the Rhône River, where the S.S. Catherine was docked pierside. With big white balloons tied to the railing of her sun deck and rows of flags flapping in the light breeze, the gleaming vessel was ready for her christening. Arriving at S.S. Catherine in such a style seemed appropriate for the celebration that would take place the next day. 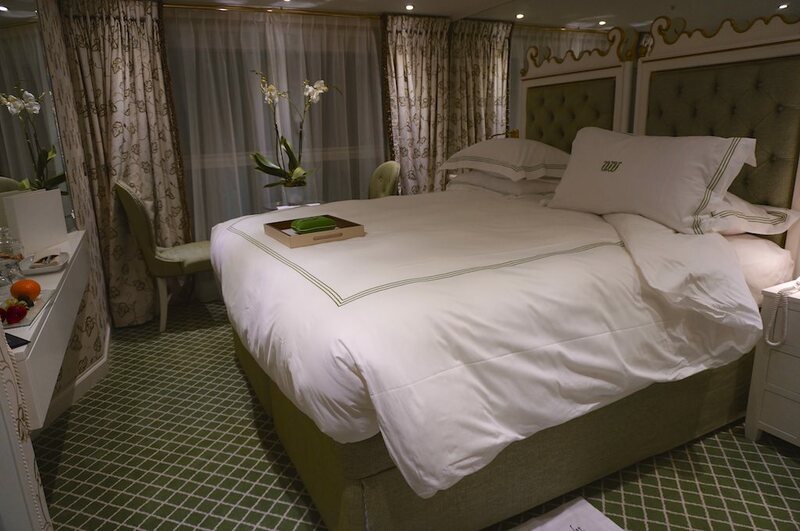 A warm greeting on board, and not more than 5 minutes after having walked up the gangway, I was unpacking in Room 326, a category 2 stateroom on deck 3. I had intended to shower, shave and join the others for dinner — or at least for drinks, but the handcrafted Savoir of England bed, custom made for Uniworld, was calling my name. I put myself between the soft sheets and slept a restful eight hours. Rarely have I experienced such a slumber. The highlight of the morning thus far came when I walked into the Cézanne Restaurant for breakfast. The room itself was gorgeous, French bistro-style with lots of flowers (tulips, irises, roses), but it was the culinary offerings that were the star of the show. Fresh berries, French yogurt, French-press coffee, omelets cooked to order, cereals, seeds and nuts. 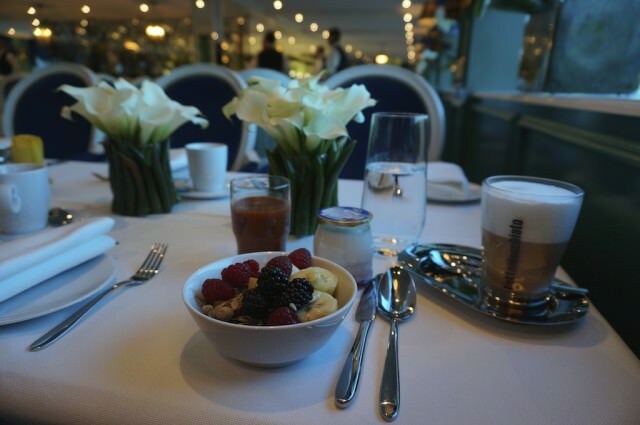 S.S. Catherine served up the best breakfast offering I have seen on a river cruise vessel. Only one small drawback: At 6’5″ my head cleared the ceiling by only about an inch. By lunchtime, I’d gotten used to the low ceiling, but at first it was disconcerting. 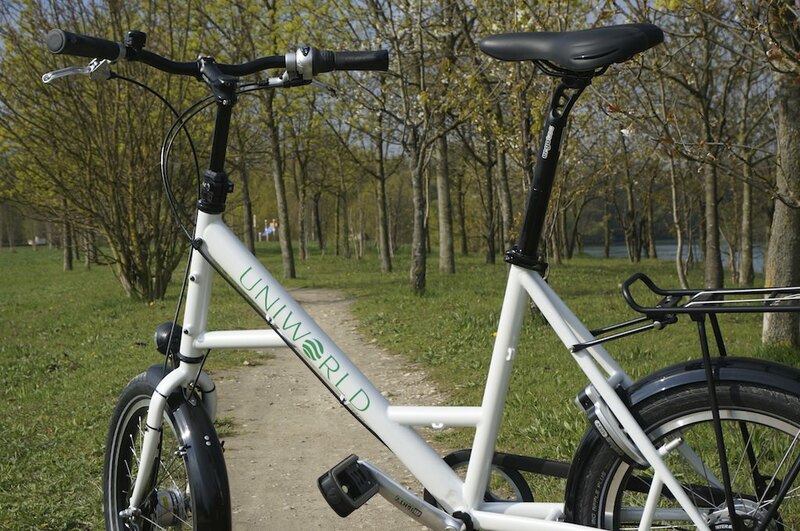 After breakfast, I asked reception to use a complimentary bicycle so that I could ride along the Rhône. Within a few minutes, one of the staff brought down a brand-new bike. At first, I thought it might be too small. The bike had 20″ wheels, smaller than normal. However, I discovered that I could adjust the seat and the handlebars to fit my 6’5″ frame — the bike was cleverly designed for function and for storage. It was as comfortable as my bikes back home. I rode 15 miles on a beautiful spring morning along the banks of the Rhône. The pedaling was easy. Uniworld’s bicycle was one of the best I’ve ever ridden on a river cruiser – and I’ve ridden many. The fattish tires made cycling through the city and over gravel easy and secure. The seat was comfortable. Gearing spanned the range for making hills easy and making time on flat stretches — and the gears were easy to shift. The bike had a kickstand, helmet and lock. 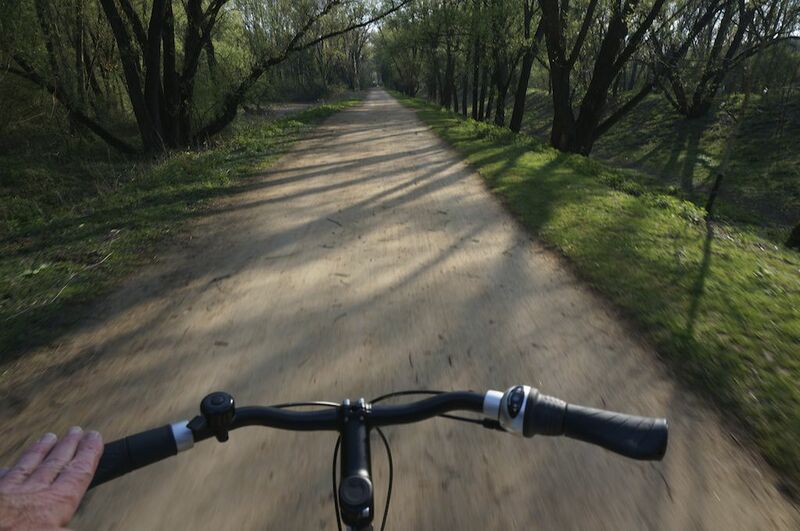 It had all that I needed, and I could have easily ridden for hours on such a beautiful day. But I knew I had to be back to S.S. Catherine for the 11:45 inauguration ceremony of Uniworld’s newest Super Ship. I certainly didn’t want to miss the christening ceremony. 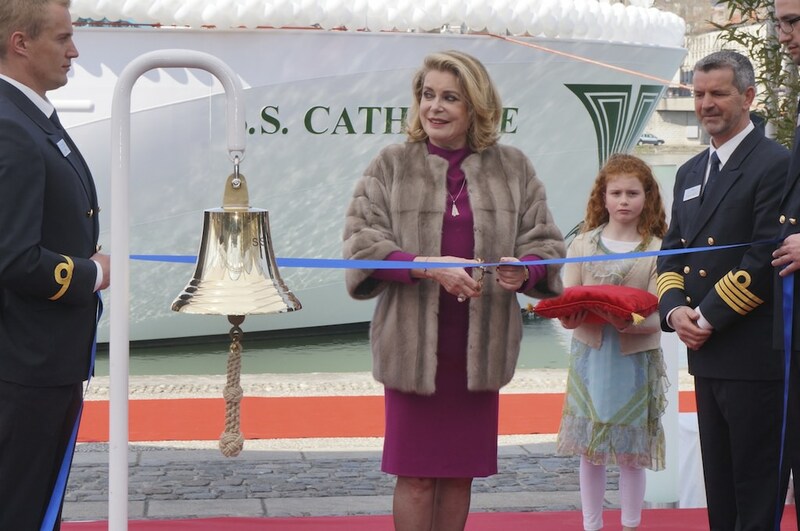 The ship’s godmother, the famous French actress Catherine Deneuve, led the red-carpet event, which was complemented by a live band and concluded with a ceremonial breaking of a bottle of Dom Pérignon across the bow. Deneuve was only a few steps off the stage before she lit a cigarette, with a small crowd gathered around her. Smoking is not as taboo in France as it is in North America or in Northern Europe. In fact, the French light up at rates more than double that of the United States and nearly triple that of Sweden, according to a report released in early December by the World Health Organization. Fully 31 percent of French adults smoked daily in 2011, compared to 14 percent of Americans and 11 percent of Swedes that same year. 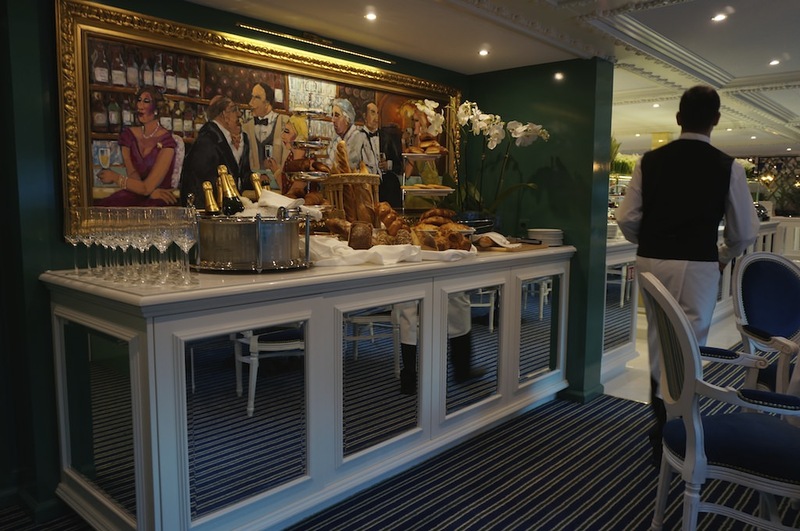 Readers should note, however, that France has strict smoking laws (including a ban to light up in closed public spaces such as restaurants and bars), and smoking is not allowed on S.S. Catherine, with the exception of an outside area beside the pilot house on the sun deck. S.S. Catherine will carry Deneuve’s name along France’s Rhône and Saône rivers. She is an appropriate and deserving godmother. Now 70 years old, Deneuve is world-renowned for her timeless beauty and boasts an esteemed acting career spanning more than 50 years. Perhaps best known for her roles in “Belle du Jour” and “Indochine,” Deneuve has been nominated for dozens of international acting awards and was chosen by the European Film Academy last December to receive a Lifetime Achievement Award. Considered the muse for Yves St. Laurent, Deneuve has also been the face of Chanel No. 5, L’Oréal, Louis Vuitton, MAC Cosmetics, and many others. As I had hoped, I shook Deneuve’s hand. 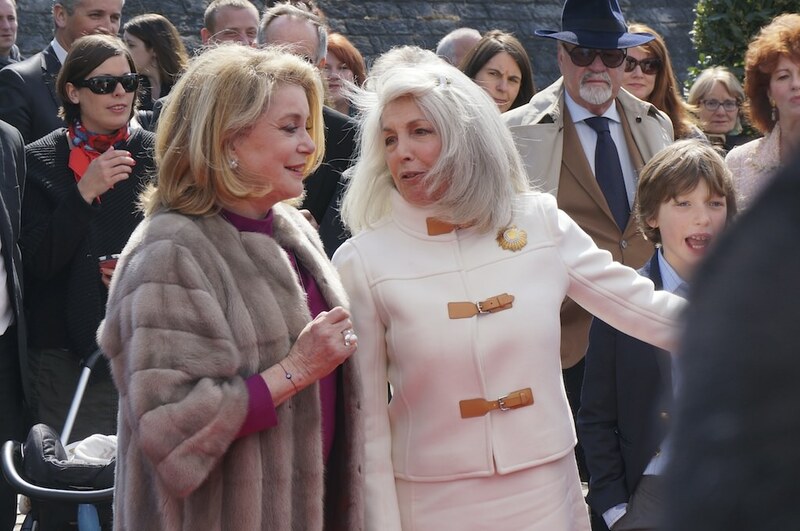 Following what I felt to be proper protocol, I simply walked up to her agent and said, “It is a dream of mine to shake the hand of Catherine Deneuve.” Overhearing me, Deneuve smiled and extended her hand, and for second I held the hand of one of the world’s greatest actresses. 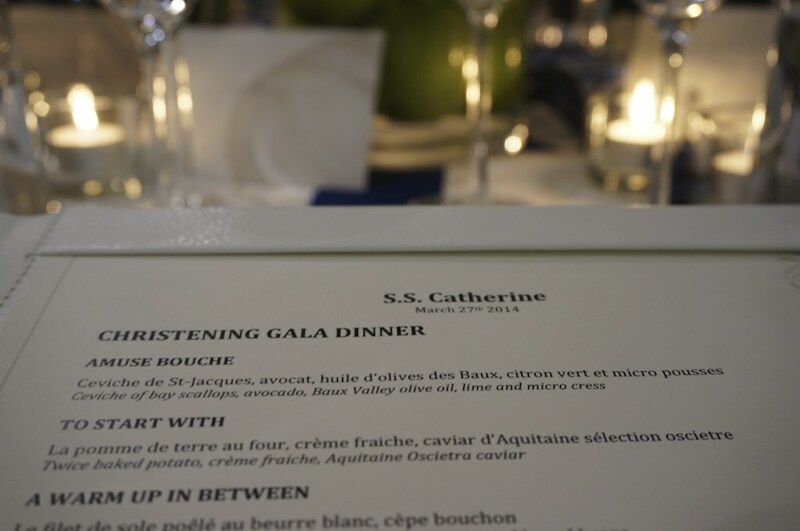 Our night ended with a sumptuous Gala Dinner, gourmet dishes with fine wines, an appropriate ending to a beautiful day in Lyon. 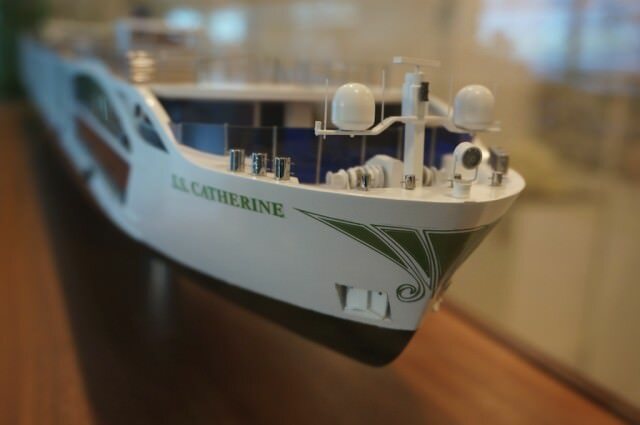 Like her godmother, S.S. Catherine is a beauty, an elegant French lady. S.S. Catherine is so French, in fact, that I felt as though I could have been in a restaurant back in Lyon or elsewhere along the banks of the river. 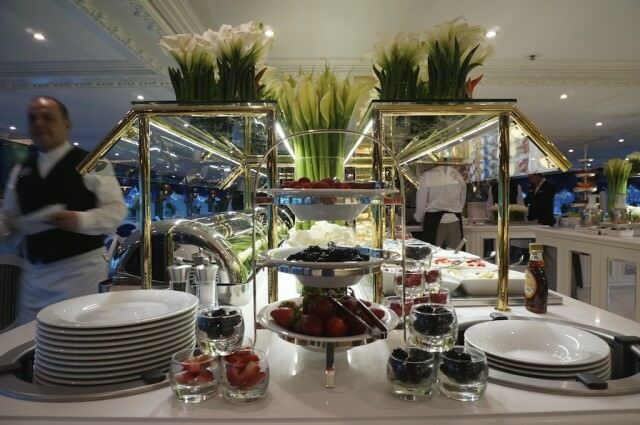 Uniworld has done an admirable job in infusing its newest vessel with French flair without going over the top. 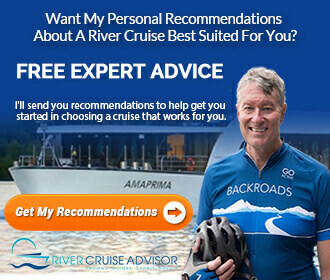 Whereas ocean cruisers often attempt to become the destination, S.S. Catherine fully complements the destination. Tomorrow, I’ll take you for a tour of the S.S. Catherine.